They Can’t Fix It, So They Will Take Us All To Nuclear Hell With Them! Results of radioactive nuclide analysis for groundwater at the east side of Unit 1-4 Turbine Buildings and seawater at the port in order to monitor the source, the extent, and the effect of the radioactive materials in the groundwater toward the ocean. *1 The highest result announced in “Detailed Analysis Results in the Port of Fukushima Daiichi NPS, around Discharge Channel and Bank Protection” or the other handouts is provided. Yomiuri Shimbun, Mar 7, 2017: On the floor under the pressure vessel of the [No. 2] reactor, a large hole was discovered. It is believed to have been created when nuclear fuel fell down. AP, Mar 2, 2017: A robot sent inside the Unit 2 containment vessel last month could not reach as close to the core area as was hoped for because it was blocked by deposits, believed to be a mixture of melted fuel and broken pieces of structures inside… [TEPCO] needs to know the melted fuel’s exact location as well as structural damage in each of the three wrecked reactors… Earlier probes have suggested worse-than-anticipated challenges… “We should think out of the box so we can examine the bottom of the core and how melted fuel debris spread out,” [TEPCO’s Naohiro] Masuda told reporters… [E]xperts are still trying to figure out a way to access the badly damaged Unit 3. 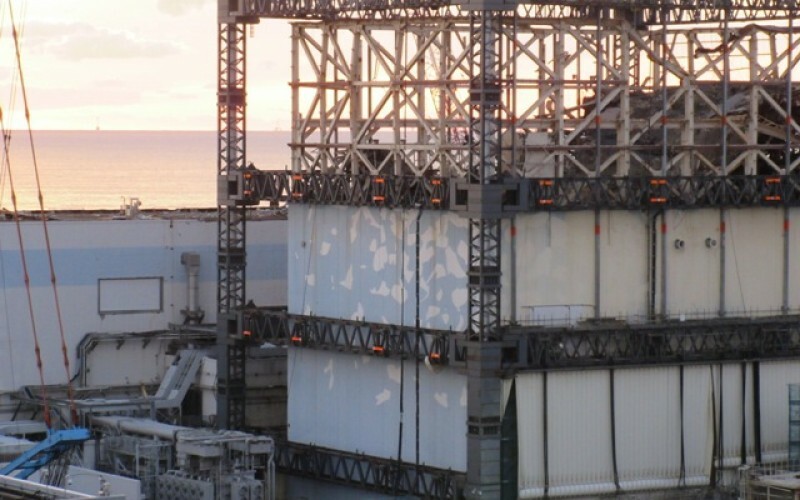 TEPCO is struggling with the plant’s decommissioning. According to Tepco, Fukushima DAINI‘s spent fuel pool of Reactor 3 had its coolant system suspended automatically. It stocks 2,360 spent fuel assemblies and 184 new fuel assemblies. No more details are announced. Approx. 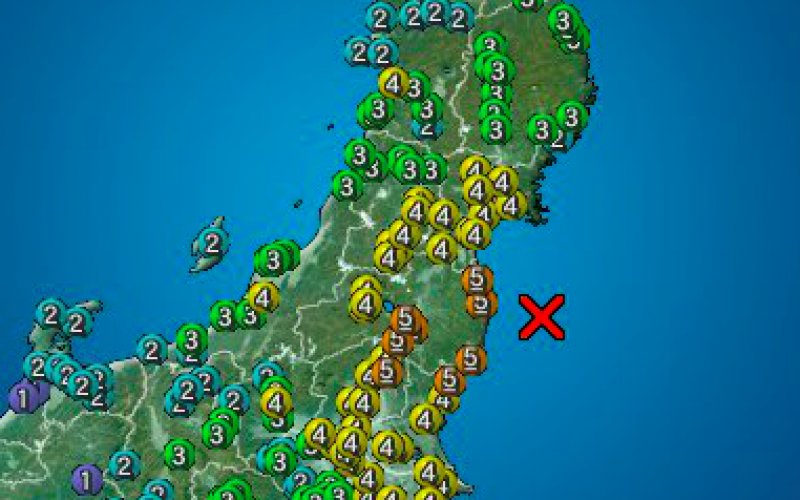 30 mins before, Tsunami was observed to have reached Fukushima plant. 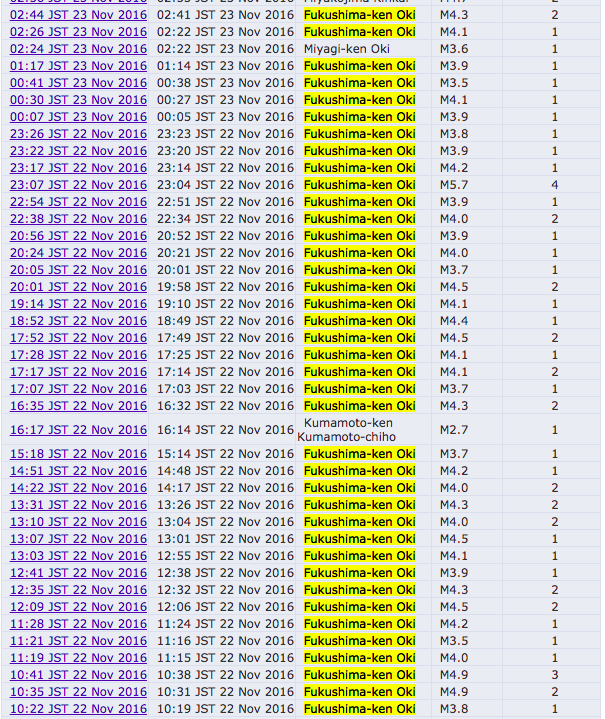 According to NRA (Nuclear Regulation Authority), Tepco rebooted the coolant system of SFP 3 of Fukushima DAINI at 7:47AM (JST). Tepco explains that the tank water level related to SFP 3 became too low to sound the alarm and suspended the pump at 6:10AM. 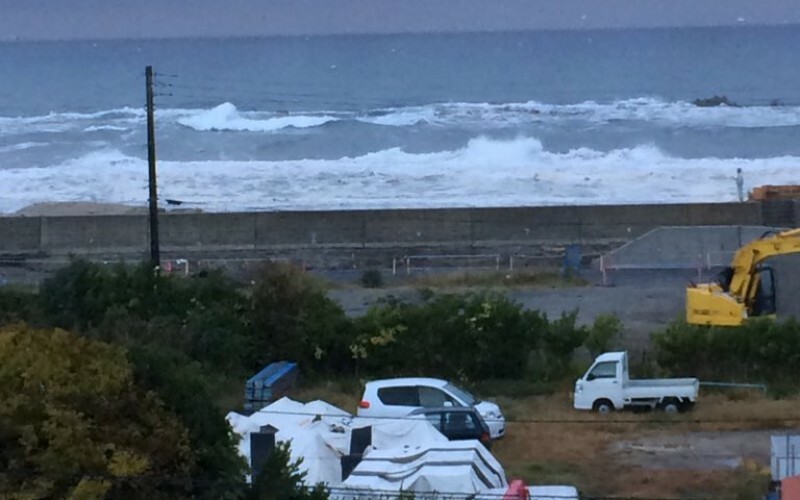 1m high Tsunami was observed to have reached Fukushima DAINI at 6:30AM. No more details are released by Tepco about Fukushima plants. A local posted on twitter that the coastal area of Iwaki city has too heavy traffic right now. Please get off from your car and run to the higher ground by foot now. This is reportedly from the eldest daughter’s information of the poster. 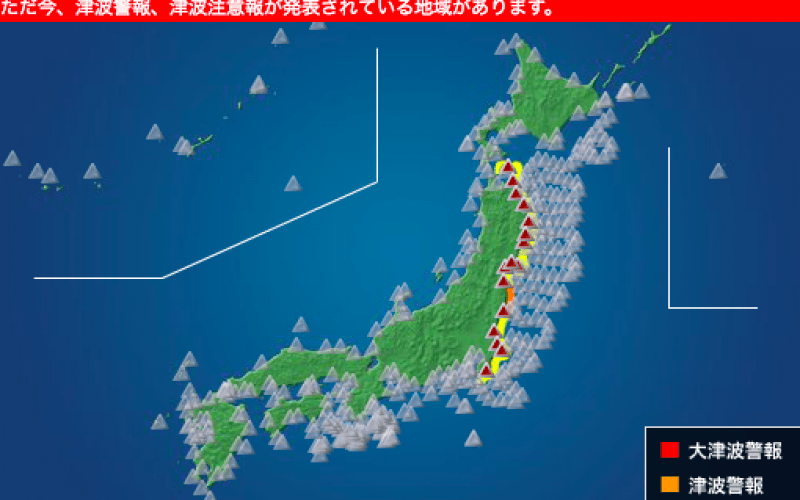 Tsunami was observed about 20km offshore. It is reaching the coastal area soon. In the evening of 11/22/2016, Tepco announced the radiation monitoring post in the sea has been suspended due to the quake. The post is situated at the end of the breakwater of Fukushima plant port. They cannot monitor the radioactive substance spreading to the Pacific with this monitoring post out of order. They also admitted the underwater fence was damaged, and also the coolant water got out of the common spent fuel pool due to the quake. It reportedly spread over 2m * 3m but the exact volume is not announced. About 40 minutes after the quake, Tepco announced they found no abnormality in Fukushima plant however 1m high tsunami was observed reaching the plant port. 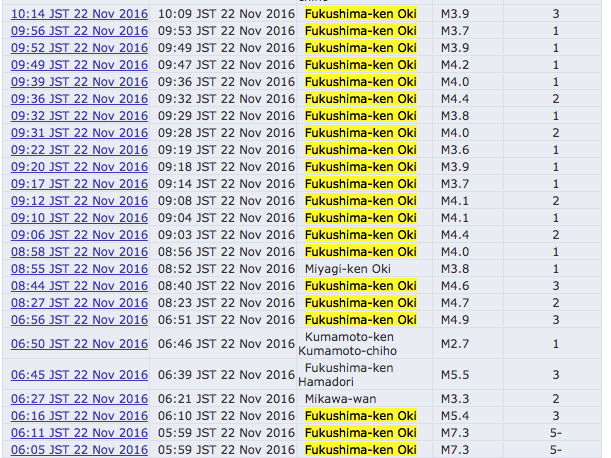 According to JMA (Japan Meteorological Agency), they observed over 85 aftershocks by 11:00 AM (JST) of 11/23/2016. 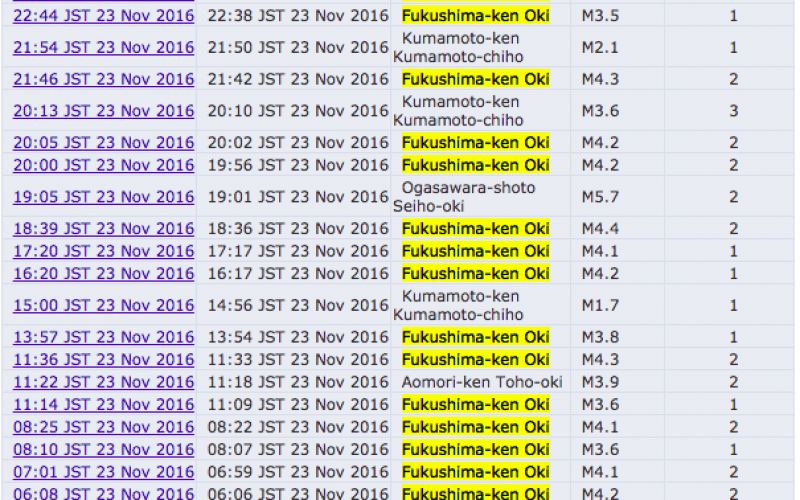 This is the count of the quakes of seismic scale 1 ~. 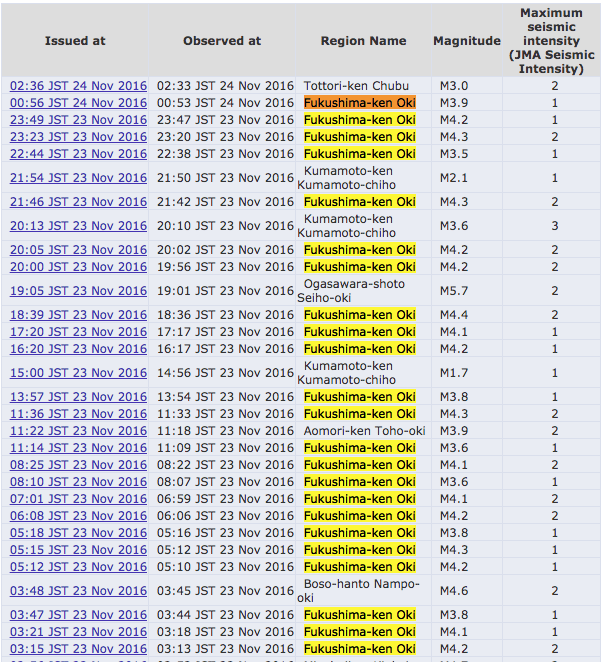 They warn the same level of the earthquake (M7.4) may happen this week again, which also may cause Tsunami. They observed 7 quakes of seismic scale over 3. 11:30 – The Prime Minister [said Fukushima] had been brought to a close. My reaction on hearing his words was, ‘Stop kidding.’ Reality is, though 4 years have passed, the accident has not yet been brought to a close at all. 15:15 – What is the situation within the core? How much has melted? Where is the fuel exactly? We do not know… This is an accident of a severity that cannot be imagined anywhere else… As you can see, we are facing a very, very difficult situation. The only choice that we have open to us is to somehow keep the situation from getting worse. 30:30 – We are in a very terrible situation, I would even call it a crisis. 55:30 – The Japanese government has issued a declaration that this is an emergency situation. As a result, normal laws do not have to be followed. What they are saying is that, in these very high radiation exposure level areas, they have basically abandoned people to live there. They’ve actually thrown them away to live there… The Cs-137 that’s fallen onto Japanese land in the Tohoku and Kanto regions, so much so that this area should all be put under the radiation control area designation [the Kanto region includes Tokyo and is home to over 40 million people]. 1:01:00 – I really do want to impress upon you that the accident effects are continuing. 1:02:00 – Bahrain’s Ambassador to Japan: If you were the Prime Minister of Japan, what are you going to do with this very complicated situation?… Koide: When you have an emergency legally declared, regular laws are put on hold. What that means is people can be thrown away into areas where normally people should not be… The first thing I would do as Prime Minister is evacuate all the children that are in the contaminated areas.